You can begin by reading my previous blog posts on lard. Consider taking a quick look at Reflections on Lard and Livin' Lardge. 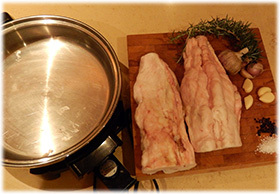 In order to capture the unique health benefits of lard, the lard has to be from healthy outdoor-raised pigs, ideally certified organic and soy-free. The pigs need to be able to dig in the pasture, grass and soil, not only for their own health and quality of life but also for the quality of the pork. When pigs are raised this way, they will provide pork and lard which is so nutrient dense and delicious. 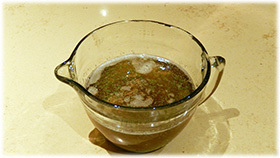 In this recipe I'm looking to make a fairly large batch so I'm going to use about two pounds of leaf lard, two very large sprigs of our own fresh rosemary, two heads of our own garlic, about a teaspoon of salt and plenty of cracked black pepper. I used our certified organic leaf lard. You could alternatively use back fat. Preparing the ingredients is so easy. Make sure the rosemary is fresh! Rendering the leaf lard is so easy. The simplest and fastest way is to put it in a slow cooker or electric frying pan on a low setting and just let it cook for a few hours. 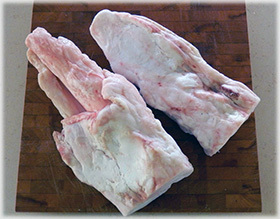 It is best to cut up the leaf lard into smaller pieces first, the rendering process will be more efficient that way. Although leaf lard has very little odor, back fat on the other hand has a stronger bacon-y odor. Although you can allow lard to render for a long time (24 hours even) you don't need to cook it that long, in this case I only rendered it for less than 3 hours because I wanted to keep the color very white and the lard to remain mostly flavorless. I rendered the leaf lard in less than 3 hours. So easy! 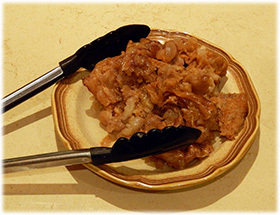 Once the leaf lard is rendered, I used tongs to remove the chunks of collagen remaining in the lard. The collagen is now infused with healthy monounsaturated fat, so don't throw the chunks away! They are very healthy. Let them dry and eat them with salt if you like. They taste so good! But they are very rich, so I only eat them in small quantities. Plenty of healthy monounsaturated fat. Now add minced rosemary, garlic, salt and pepper. 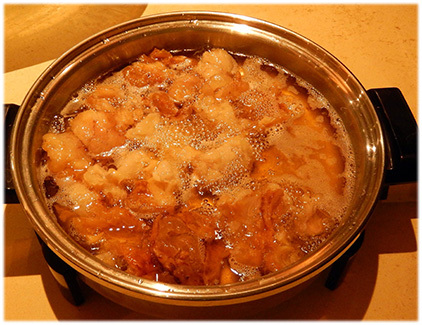 Save the left-over chunks of collagen --- they are very healthy! Then I just left the lard on the counter overnight and let it naturally harden. It turned white of course. I left mine sitting for about 10 hours. 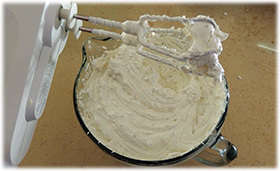 Once it hardened, I used a hand mixer and began to whir-whir the lard. I did this for a few minutes, as if I was whipping egg whites. I am thoroughly mixing the minced rosemary and garlic into the lard, and also stiffening the whole thing. 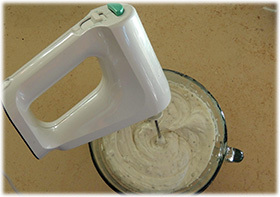 Use a hand mixer once the lard has hardened. In a few minutes, the lard is whipped. Now it is all ready! I like to spread the whipped lard on french bread, it tastes so good! It can also be put on steamed vegetables, potatoes, or however else one might use butter. This whipped lard recipe can be a fantastic alternative to garlic butter and offers great benefits because it is so high in monounsaturated fats and vitamins A, D, E and K. The presentation is very nice, too! I store rendered lard in the fridge in jars, and it lasts for many weeks! Interested in trying the recipe yourself? Get started here. 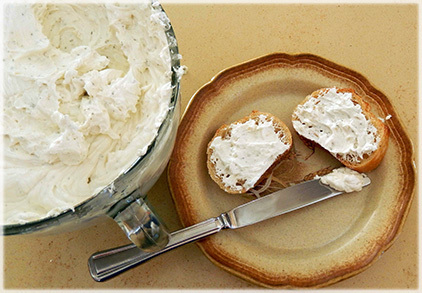 Whipped lard on french bread --- a great presentation and so delicious!